Arthur A. Levine Books, 9780545639125, 48pp. 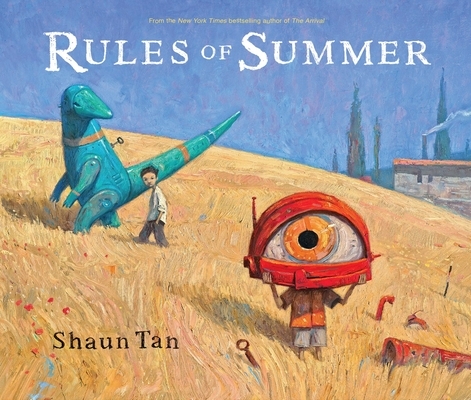 In a book that reads like an homage to The Mysteries of Harris Burdick, Lindgren award-winner Tan (The Arrival) offers a sequence of paintings that represent a boy’s cumulative summer knowledge, framed as rules and populated by Tan’s now-familiar menagerie of one-eyed robots, malevolent rabbits, and windup dinosaurs. The rules appear on the left, while lavish, brilliant paintings of the accompanying disasters light up the opposite pages. An older boy yanks his younger brother away from a platter at a soiree full of glaring raptors (“Never eat the last olive at a party”); frowns when bats, lizards, and sea anemones move into the living room (“Never leave the back door open overnight”); and, after a fistfight, bundles the younger boy into a locomotive and sends him off through Siberian wastes (“Never lose a fight”). At last, the older brother relents and rescues the younger boy (“Always know the way home”); they arrive in a lush, Wayne Thiebaud–style paradise of gigantic fruits and puddings through which they parade with drum and horn. As always, the swirl of emotion that Tan’s artwork kicks up lingers long after the book is closed.